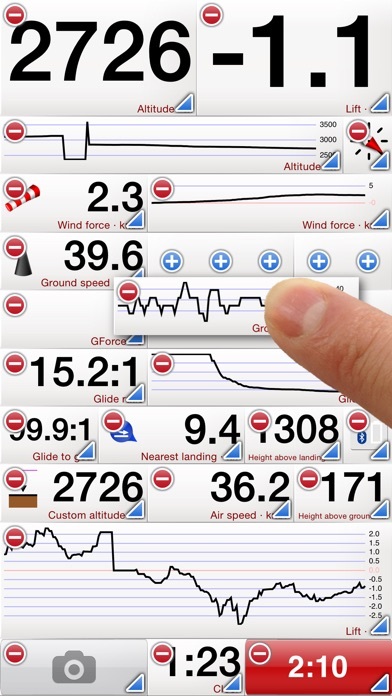 Flyskyhy forms your flight instrument during flight and shows all information you need for that. 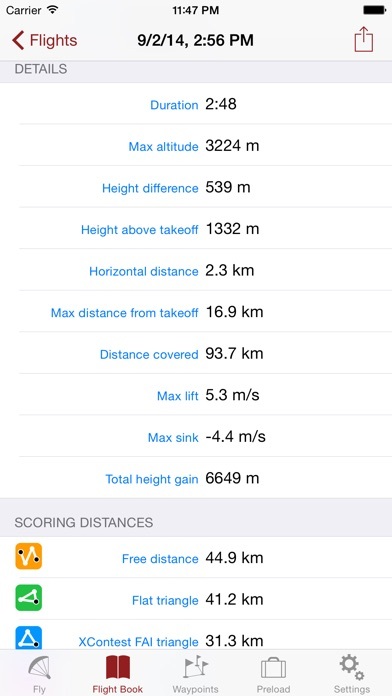 You get the normal data like altitude, climb rate, ground speed, and glide angle. But it also calculates and shows the current wind direction and strength, very important for your safety. 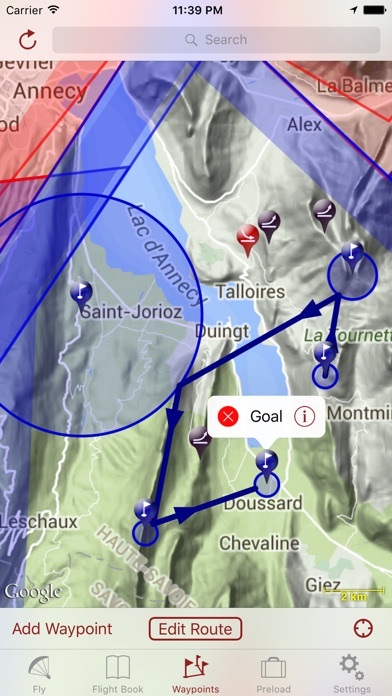 A moving and rotating map shows your current flying position and flight trail. It indicates where you have gone up (in a thermal), and where you have had faster than normal decline. With that, you can easily find back that thermal that you lost. The map also shows the nearest known landing spots, and whether they are reachable by normal glide, given your current altitude and wind direction. Integration with Bluetooth varios SensBox, FlyNet, GoFly iPico, XC-Tracer, BlueFlyVario, or SkyDrop gives accurate altitude and lift information. That turns your iPhone into an full-fletched GPS-vario, including vario tones. The app makes a full log of your flight, that can be analyzed afterwards. Besides normal data like start and landing positions, duration of flight, and an altitude graph of the flight, Flyskyhy also calculates the scoring distances for you. So you can immediately see whether you have broken that FAI triangle record. Your live location is reported on livetrack24.com or loctome.com if you desire, so anybody can follow your flight while it is happening. If you are flying together with friends, then their location is shown on your map during your flight. So you never have to wonder anymore whether they are in front of or behind you. The flight display has multiple screens which are all fully configurable. You can move all elements to other spots, delete and add elements, and resize them. Through in-app purchases, the app also supports airspaces and waypoints. 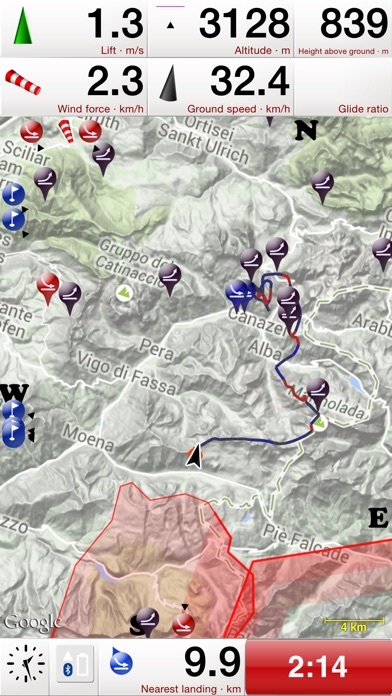 The app is optimised for paragliding and hang gliders, but can be used with all kinds of airsports. • Replay the flight and relive it! 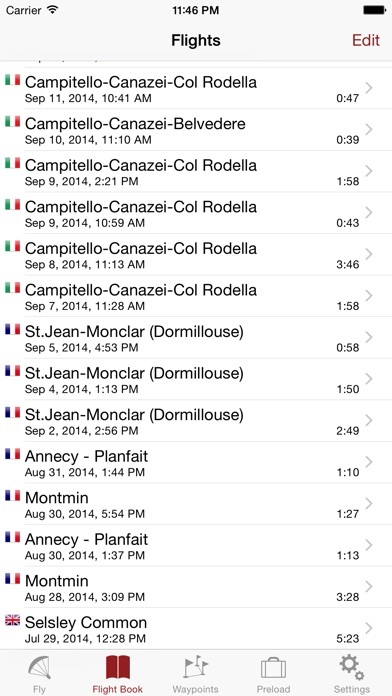 • Full route support with start time, goal, entry/exit points, etc.